In a conversation, a few days ago, a customer snorting said with a certain impatience: “This cold and this rain darken me and I get all the doubts and questions in the world”. I have long thought about these words because they give voice to a feeling common to many and why they hide aspects that are perhaps not so trivial, aspects that have a lot to do with our cultural habit to perceive and judge us. Many parts of us live together, we are not monolithic pieces of stone, but we resemble more like rainbows, or kaleidoscopes of lights and shapes that are constantly changing around what we have deep inside. Within us there are thrusts and impulses of opposite signs that alternate their influence, and it is always useful to stop and notice them, without judging them, but only by becoming aware of them, and trying to see beyond, at the center of us. Do you remember when I wrote that we Humans have “feet on the ground and head to the sky, while heart and belly are halfway”? Think about how a strategic and rational mind can coexist with a very powerful emotion. Notice how much we know to be direct and peremptory in certain situations, while in others we show soft or even hesitant. And if sometimes we are capable of discipline and rigor as adults, sometimes we would like to play and have fun as only children can do. Thus the thrust towards dynamism and action coexists in us, but also the need for slowness and rest. Inside us there is the euphoria and the enthusiasm, but sometimes even more melancholic notes and moments of easy tear. If we limited ourselves to using the yardstick of reason to observe ourselves, we would see contradictions and contradictions everywhere within us. If we then followed our habit of dividing everything between right and wrong, good and bad, positive and negative, we would probably end up assessing our euphoric, dynamic and cheerful side as right, and would limit ourselves to defining the opposite pole as wrong; slower, melancholy, restless, doubtful. Worse still we would begin to convince ourselves that we are this or that, nothing more and nothing less. And yet it is not the case, and if we can observe our opposites, we can also make peace with them. Our culture has accustomed us to judge ourselves, others and what surrounds us in a Manichaean perspective with the categories of good and evil, positive and negative, right and wrong. And so we come to think that the only way to feel good is to always be dynamic, active, in a good mood, possibly agile, snappy, sharp and productive. How about slowmess, silence and rest? No thanks, there’s no time. And we also have the courage to complain or wonder if we get sick? Once again we try to learn from nature, which knows no judgment and does not question whether it is coherent or not to allow it to alternate rains and sun, day and night, heat and cold, summer and winter. In nature there are cycles, not judgments, and everything exists so that its opposite can exist. There can not always be the day, there can not be only the night, and if autumn and winter did not exist, we would not know spring and summer. Why then should we reproach ourselves if we are sad or a little gloomy, if we need silence, slowness or rest? And why should we ever question our personal value if we see something in us that is not what is required of us or suggested by others or by our inner judge? Rather, we learn to look at our inner instances, our emotions and our thoughts without judging them. How you do it? Everyone has his way. Inside me there is a rainbow of shapes and shades, and I have slowly sought to become aware of it. So I wanted to give a name to those two poles including rocking from season to season, from day to day. I like to define yellow as my most vital, creative, open, solar and sparkling part, I define blue instead that side of me that is more shady, slower, sometimes melancholic, but also sweet and delicate. 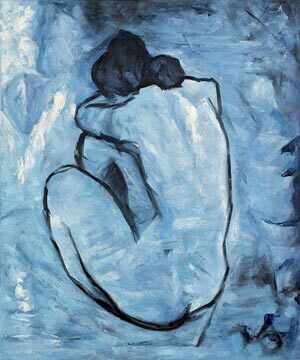 Defining blue that melancholy and that easy tear that came to me from time to time was my first step to learn to love that side that jarred so much with the dictates of a society that would take us in a different way. I realized over the years that if I did not allow me the moments in which to slow down, rest, and even close, I would struggle to conceive, create, design with the same passion and the same intuitive ability that I have when I reopen after closing for a little’. “With this cold all doubts and questions of the world come to me …” This is precisely the message of the blue, or moments of closure. When we are forced to slow down, stop, look inside, the questions emerge. But if we do not judge taking a break as a waste of time , if we abandon ourselves for a moment to melancholy and blue, we can perhaps accept the challenge that those questions throw us. Let’s give us time to enter the blue-tinged questions and let’s have time to hear all the answers, even the less pleasant ones. I remember well the words of my teacher at the Counseling course: “Remember that frustration is useful, because if accepted, it makes us see what is wrong and helps us to activate ourselves to get what we want”. We ask ourselves what we lack, and in the meantime we look what we have in our hands. We listen to the nostalgia of what is not there, and taking stock of what we have, we really ask ourselves what we want for us and what we are willing to give to get it. Can you stop and look a little closer? Could you name your opposites and your interior swings?